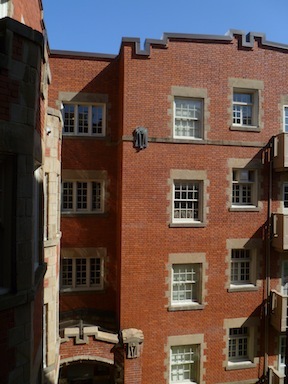 The Trinity Apartments were built in 1910 and are the work of Knighton and Root. Knighton was the architect of such buildings as the Oregon Supreme Court, the Governor Hotel, and Johnson Hall at UO, to name a few. 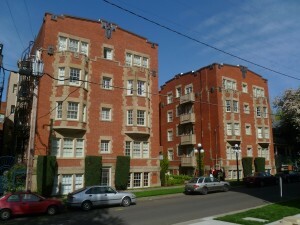 The apartments are well built, with much of their historic detail intact. A courtyard building, it actually two buildings joined in the middle with separate stairs and elevators on each side. 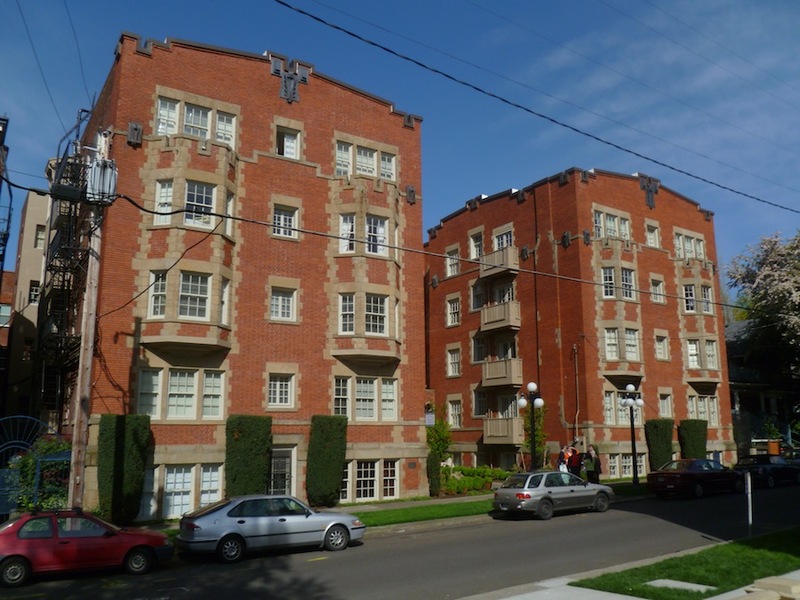 The fact that they are built of unreinforced masonry puts them at particular risk in an earthquake, due to the brittleness of the brick walls. However, the steps taken of in this project go a long way to mitigating these problems. The quality of construction is also a positive factor, as is the fact that the number and symmetry of interior walls also act to stabilize the building. The seismic work on the Trinity Place apartments is being done in phases. The first phase was recently completed, and consisted of tying the floors and roof to the exterior walls. The roof and floors need to work as a diaphragm. 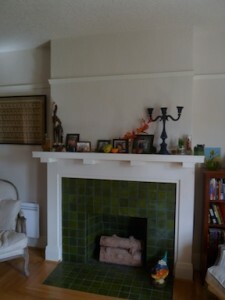 This often requires adding plywood to create this effect. This was the case for the roof, but the floor sheathing and wood flooring in this building were sufficiently well built to act as a diaphragm without additional sheathing. The work entailed waiting for tenants to vacate apartments as well as vacating or displacing tenants so the work could be done. While the building is symmetrical, a plus for seismic resistance, the U-shaped courtyard does present some challenges. This will be the focus of the second phase where cores will be drilled in the center of the masonry walls every four feet and then filled with epoxy. The cores will be attached top and bottom and the wall put into compression so it will act as a single shear wall. An elegant solution for unreinforced masonry buildings which protects the interior finishes. 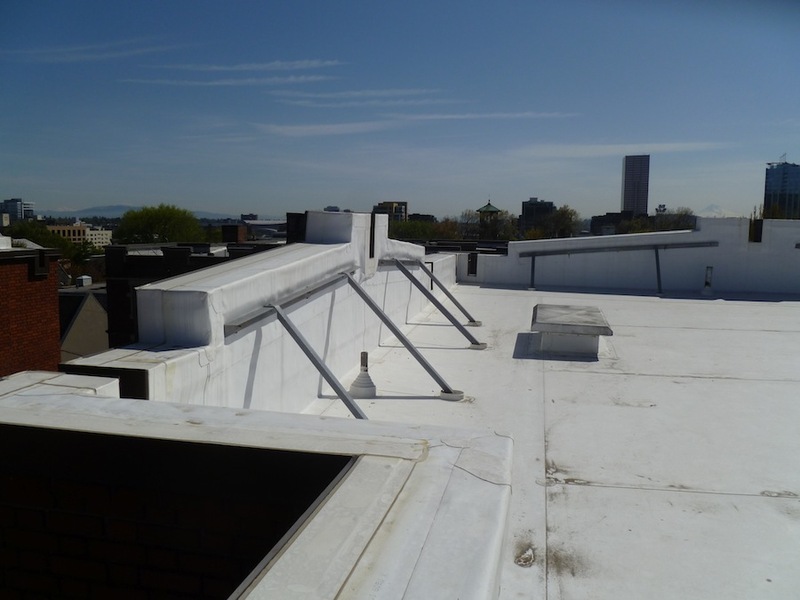 This method was used for the recent restoration and seismic upgrade of the Portland Train Station. makes Portland, Portland. Another important reason to seismically upgrade these buildings is that they represent thousands of units that will be desperately needed following an earthquake. One of the keys to successful recoveries from earthquakes and other natural disasters, are intact dwellings, particularly multi-family units, which insure that the work force has a place to stay. It should be noted that this seismic work is to bring the buildings up to current life/safety code levels. This level of performance is based on people safely evacuating the building and not on whether the building is either reparable or useable following an earthquake. The owner is aware of this and is beginning to ask the question about performance and seeing what the up charge in cost could be. Builder owners and design professionals often don’t ask this question, but it is a critical one when considering how useful will be following an earthquake. Given that the expense opening up the walls and roof is already being done, larger or more strapping is just an incremental cost that could easily be worthwhile if insures useability.